We decided to let all our fellow nerds decide if you want to know about Batman Dark Knight Returns Part 2 through audio, video, or text. The audio and text have recap of part 1.The video was to long to have a recap of part 1. The audio and video were both recorded at the same time. Pablo edited the video and the Ambassador edited the audio. Dark Knight Returns Part 2 "Batcast"
Some of this will be a repeat from my Part 1 Review but I'll do my best to keep it fresh. The beginning of the film gives a pretty solid recap of what happened in part 1 through a news report but there's no substitution for actually watching part 1 and reading the book. I've said this before and I'll say it again, the movie is not a substitution for the book. They are completely different mediums and therefore incomparable considering certain elements. One thing that I will be reviewing is how good of an adaptation of this film is from the book. The biggest differences between the book is the lack of narration and the constant barrage of the media. Allow me to go into further detail about this. In the book Bruce is constantly narrating what's going on in his head. Some of his narration was translated as dialogue in the film but not most. As I said in the book there was an unrelenting bombardment of the news. Some of it was in the adaptation but not all. These elements could have been a more integral part if the film. A few things were in the adaption of the book were done better. Peter Weller's performance was even better as the story became more intense than part 1 and hit its climax and him with it. Some people may complain that he is monotone and lacking emotion. Personally I think that makes him the perfect old man Bruce Wayne because the Batman I know always keeps his emotions in check. It's those intense moments when Bruce lets loose and Weller shows his chops. 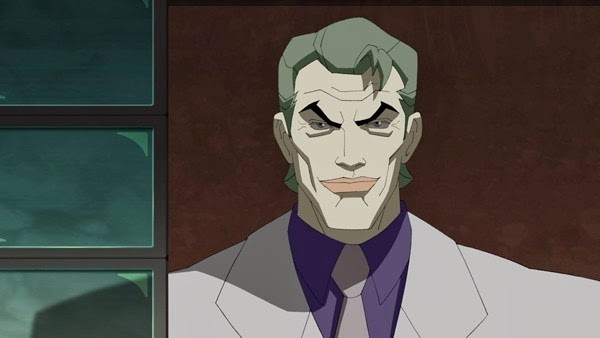 Michael Emerson voiced the aged Joker. First of all I didn't think he sounded old enough. I also feel like he didn't fully get the craziness of Jokers voice down until a certain part of the movie, the fair grounds. As my wife said he kind of sounded queer, in all sense of the word, but as the Ambassador pointed out he really is queer in every sense of the word. Part of me thinks that Emerson toned his Joker voice down because the character was trying to fool everybody into thinking he was ok, normal, rehabilitated. Joker acted and sounded completely unhinged, demented, and mad after he unconventionally shanked a guy. Mark Valley did a superb job as Superman. He sounded and emoted perfectly. The story itself was so freakin awesome. You have never seen Batman like this and yet there are plenty of classic Batman moments like him using disguises. This Bruce is more brutal than even the Nolan movies. Whereas I thought part 1 was the most violent animated film I had seen this one is the most intense, brutal, and dementedly powerful movie I have ever seen. It's not so much something that has never been done before as HOW it's done. Joker breaks out, Batman fights the Gotham City Police, there's a Batman/Joker face off and Batman/Superman face off. There's also this deep underlying theme about fascism. The Batman vs Joker fight comes down to two old men beating the hell out of each other. 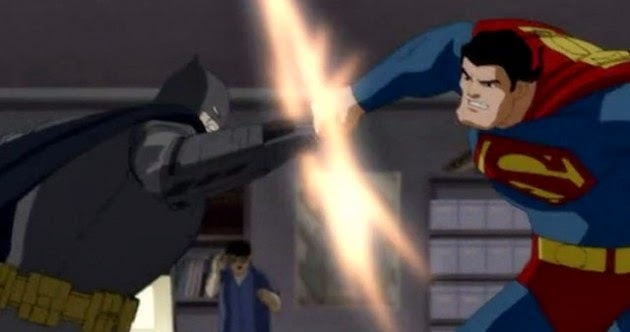 When Bats faces off against Supes he completely unleashes on him. Unfortunately there will not be a part 3 despite how it ends. Personally I think it would have been a better book and story if it had ended differently. Honestly that is my biggest complaint. The animation is extremely close to the art style. Peter Weller, Ariel Winter, Mark Valley, and even Michael Emerson were excellent though I had minor issues with his Joker at first. Old man Bruce is more intense, brutal, and badder than ever. As always the Blu-Ray was loaded with extras. All these things combined and more make this a MUST BUY for even the average non- nerdy consumer.